This gorgeous Adagio is the central movement of Wolfgang Amadeus Mozart's Flute Quartet in D major, composed in 1777. 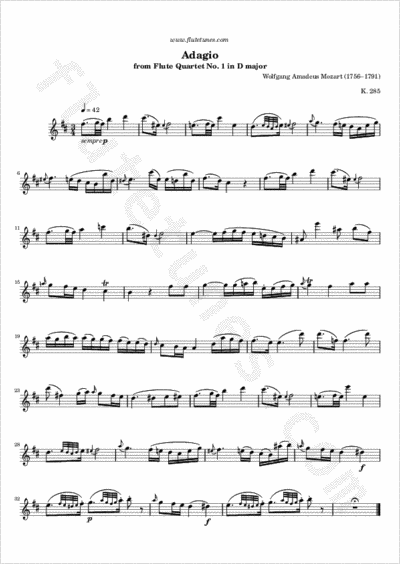 In this case, “flute quartet” does not mean that the work is written for four flutes; instead, it is scored for flute, violin, viola, and cello. As with his other flute quartets and the Oboe Quartet in F major, Mozart constructed the work as if he were writing a string quartet with the wind instrument replacing the first violin. Thanks to Erika for suggesting this piece!